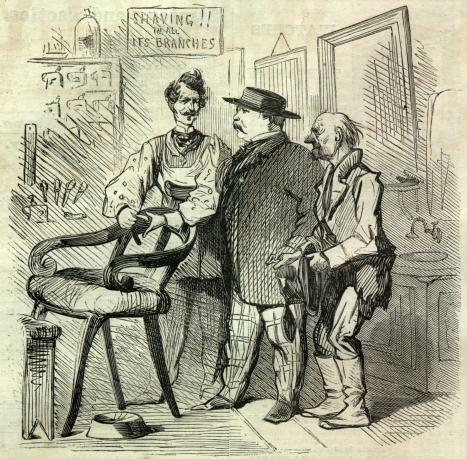 VOLUNTEER-BROKER (to Barber) "Look Look a-here — I want you to trim up this old chap with a flaxen wig and a light mustache, so as to make him look like twenty; and as I shall probably clear three hundred dollars on him, I sha'n't mind giving you fifty for the job." G. S. HASKINS & CO., 36 Beekman Street, N. Y.
BENJ. W. HITCHCOCK, 455 Broadway, N. Y. A Beautiful Engraved Gold-Plated Watch and Chain, fine Swiss movement, handsome dial and hands, warranted a perfect time-keeper, for 8 Dollars. Engraved Silver, same as above, chain included, 8 Dollars. A very heavy Hunting Cased Solid Silver Watch, full jeweled, and fine English movement, silver capped, warranted a perfect time-keeper, and a handsome Gold Plated Chain included, for 11 Dollars. We will send, on receipt of the money, one of our Watches and a Chain, by mail, postage paid, to any address. These Watches are especially adapted to the Army, being heavily cased and perfect time-keepers, and in running order. No. 208 Broadway, New York. AGENTS, male or female, SOLDIERS, and all having some time to spare, are particularly requested, as a FAVOR, to send us their address, and we will send in return, FREE, information for which they will be THANKFUL. We offer EXTRA INDUCEMENTS. From $6 to $15 per day ABOVE EXPENSES. We want addresses from EVERY COUNTY in the U. S., and from EVERY REGIMENT in the Army. Address in full, RICHARDS & CO., 37 and 39 Nassau Street, Box 3131, N. Y. Friends. Send a stamp for my Circulars. Address L. M. HARRIS, Boston, Mass. To the Loved One at Home. We will deliver, free of freight chage, at any Express Office East of St. Joseph, Mo., any of our beautiful Albums of the value of $5 or more, that may be ordered by members of the Army or Navy of the United State as Presents to friends at home. We manufacture elegant styles at all prices to $25, and higher. Patent compressed Ivory Billiard Balls, 2 1/2 and 2 3/8 in., $10 per set. 2 in. Bagatelle. $8 per set. 1 3/4 in. Bagatelle, $7 per set. 15 Ball Pool, $30 set. WM. M. WELLING, 207 Centre St., New York, sign of the Golden Elephant. Pimples and Freckles, may easily be procured by using the "BALM OF THOUSAND FLOWERS." For shaving it is unsurpassed. It is composed of palm oil, honey, and other valuable articles, highly perfumed by its own ingredients, and when used for washing, night and morning, renders the skin soft and white, and free from blemish. Price 50 cents. U. S. One Year CERTIFICATES OF INDEBTEDNESS. U. S. COUPON BONDS OF 1881. U. S. 7.30 TREASURY NOTES. U. S. QUARTERMASTER CHECKS. Maturing Certificates of Indebtedness collected on favorable terms. BANKERS, No. 44 Wall Street, N. Y. A Household Word.—Buy your Housekeeping Articles at BASSFORD'S,Cooper Institute, New York. Manufactured and for sale on Straps, at wholesale, by F. STEVENS, Manufacturer of Skates, Straps, and Leather Goods, 215 Pearl St., New York, 68 Kilby St., Boston. IN those cases of scanty, retarded growth, where the person is over 18, by its remarkable nourishing and stimulating power, the Tennessee Swamp Shrub Balsam has been found infallible, in exciting the Beard, Moustache, &c., to an exceedingly fine and vigorous growth. The history of this Balsam, with a small sample box, will be sent sealed, on receipt of return postage. JOHN RAWLINS, 815 2roadway, N. Y. To all who wish to make Money. Send your address to J. W. YALE, SYRACURE, N. Y., and you will receive, free, a sample of YALE'S CELEBRATED FLAG OF OUR UNION AND MILITARY PRIZE STATIONERY ENVELOPE, with circular. Magnifying small objects 500 times. MAILED FREE everywhere for 30 CENTS. Five of different powers for $1.00. Address F. C. BOWEN, Box 220, Boston, Mass. IVORY PHOTOGRAPHIC SLEEVE BUTTONS (Patent applied for), with perfect likenesses of the President, Distinguished Men and Generals, $1.00 per pair. Also fine Ivory Brooches, $2.00; Earrings, to match, $2.00, White and Imitation of Jet and Coral. Manufactured and for sale by WM. M. WELLING, Agent, 207 Centre Street, New York, Sign of the Golden Elephant. Sent free on receipt of the price. NOW READY. "SECOND YEAR OF THE WAR." By E. A. POLLARD, Editor of RICHMOND EXAMINER, And Author of "FIRST YEAR OF THE WAR." 1 vol. 8vo, 400 pages, Cloth $2.00. With Portraits on Steel, recently taken, of Vice-Pres. STEPHENS, Generals LONGSTREET, HILL, BRAGG and JOHNSTON. PLANS OF BATTLES. This volume brings the History of the War, from a Southern view, down to the close of the late invasion in July of Pennsylvania. Written with clearness, independence, and ability, and, as the only connected account of all the civil, military, and naval operations in the South, it is of great importance and interest. It gives a thrilling narrative of campaigns which were filled with interesting incidents and brilliant action. The first edition of 5000 copies has been entirely taken up in advance. Therefore the Publisher would request the Trade to order early. C. B. RICHARDSON, Publisher, 506 Broadway, N. Y. Agents should be careful in directing their orders for our Original and "only Genuine" Extra Large Size Stationery Prize Packages, which have become so popular through the fine quality and value of their contents. As we have several imitators, who copy our Styles, Advertisements, Premiums, &c., for the purpose of deceiving Agents, we are the only manufacturers of the "Celebrated Rickards Prize Packages," and none are genuine unless bought direct from us. Those parties who advertise to give a "Premium Watch" to agents will not do so unless the agent first pays them from $40 to $50 in cash. This "we challenge any of them to deny." We will present a case of 100 of our Finest Packages to any agent who obtains a watch from them without first paying the above-named amount. Their attempt to present premiums, after our long-established custom, is in this case but a poor dodge. We still do as we have done for years past, present free to every one who acts as our agent a Fine Gold or Silver Hunting-Case Watch, "Genuine English Movements," and warranted a correct time-keeper. These watches are presented on the spot or sent with the first order. No one else does this. Our Wonderful Packages contain more really valuable articles than any half dozen others ever sold. Among the surprising contents of each package will be found Fine Stationery, Pens, Pencils, Envelopes, Ladies' Fashion Plates, Designs for Needle-work, Cottage Keepsakes, Household Companions, Letter-Writer's Instructor, Parlor Amusements, Gent's Pocket Calendars for 1864, Union Emblems, Camp Companions for Soldiers, Military Likenesses, Games, Army Advice, Rare Recipes, Many Ways to get Rich, Yankee Notions, Fancy Articles, Rich and Costly Presents of Fashionable Jewelry, &c., &c., all together worth many dollars, for only 25c. Agents make immense profits. 100 to 200 per cent. allowed. We guarantee smart agents can make $15 per day. Our regular agents average that. Our Packages stand same as ever, above all others for quality and quantity of contents. Agents wanted in every camp and town in the country. Goods sent safe to all parts of the army. Send for our Great New Circular for 1864, containing Extra Premium inducements, free. S. C. RICKARDS & CO., 102 Nassau St., N. Y. Only Original, and Largest and Oldest Prize Package House in the World. A Beautiful Engraved Gold-Plated Watch, Lever Cap, small size, English Movements, perfect time-keeper. Sent free by mail, in neat case, for only $7. A Solid Silver, same as above, $7. Specially adapted to the ARMY. CHAS. P. NORTON & CO., 38 & 40 Ann Street, N. Y.
Frank Leslie's Illustrated Newspaper, of Aug. 22, says: "Messrs. NORTON & CO. have combined two very desirable things in a watch — cheapness and reliability. When it is known that for $7 a person can have an excellent timekeeper, there will be greater punctuality in all the affairs of life." Warranted superior to any other Pistol of the kind. Also Pocket and Belt Revolvers. Sold by the Trade generally. E. REMINGTON & SONS, Ilion N. Y.
of a new vintage, surpassing in richness, fineness, and delicacy of quality any Wines of the same grade ever before sent by this house. A trial of the same will convince the most fastidious. CHAS. BELLOWS. W. S. CORWIN & CO. H. D. FELTER. MACY & CO. W. H. JACKSON & CO., PURDY & NICHOLS. J. P. VAN ROSSUM. JAMES MEYER, JR., 43 Beaver Street, Sole Agent in the U. S. for Jules Mumm & Co.'s Champagnes. For Indigestion, Heartburn, &c., manufactured only by S. G. WELLING, and sold by druggists generally. 50 cents per box. Depot No. 207 Centre St., New York, second floor. Sent free by mail for 65 cents. Genuine Full-Jeweled American Lever Watches, in 4 Ounce Coin Silver Hunting Cases, Gold Joints, for $35. Also every variety of good Watches at equally low rates. All orders from the Army must be pre-paid, as the Express companies will not take bills for collection on soldiers. J. L. FERGUSON, Importer of Watches, 208 Broadway New York. Subscription price $3.00 per year, postage paid. Club Rates liberal. For full particulars address the publishers, TICKNOR & FIELDS, Boston. The ONLY reliable Self-Adjusting Wringer. No wood-work to swell or split. No thumb-screws to get out of order. WARRANTED WITH OR WITHOUT COG-WHEELS. It took the FIRST PREMIUM at Fifty-Seven State and County Fairs in 1863, and is, without an exception, the best Wringer ever made. Try it, and Judge for Yourself. It will wring any thing from a thread to a bed-quilt without alteration. Patented in the United States, England, Canada, and Australia. Agents wanted in every town. No. 2, $5.50; No. 1, $6.00; No. A, $8. No. 13 Platt Street, N. Y., and Cleveland, Ohio. S. C. NORTHROP, Agent. Carrying the copper water-proof cartridge, and also using ordinary loose ammunition. This arm is now admitted by all competitors to be superior to any other ever offered to the public. Its simple construction and perfect workmanship are a sure guarantee against getting out of order. The great advantage of loading with either fixed or loose ammunition alone makes it superior to all others. These arms are made for both sporting and military purpose, and have been adopted both by the General Government and a number of States. We have the highest testimonials of their efficiency and durability. We also offer to the Public our new Cartridge and loose ammunition loading revolver. This arm has no equal as a belt or pocket weapon. No one wishing a first-class arm should be without one. For further particulars send for descriptive circular. P. S. Do not forget that both Rifles and Pistols may be used with either copper cartridge or loose ammunition.